A swimming pool fence is a barrier enclosing a swimming pool with the purpose of limiting access, particularly for young children and pets. Swimming pool fences save countless lives annually by protecting kids and pets from accidental drowning in home pools. You can use a protective baby fence to restrict access to the pool area. The rate of toddler drowning deaths in home pools is alarming, but such incidents can be easily avoided with the right protection in place. The use of swimming pool fences is a great way to protect your toddlers, pets and kids under 12 who don’t know how to swim. 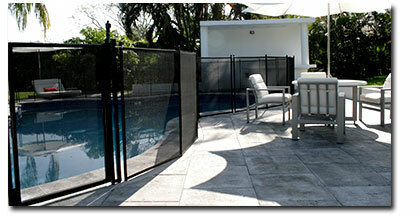 There are different types of swimming pool fence; Life Saver New York installs 2 brands of removable mesh pool fence. The removable swimming pool fence by Life Saver is by far the best in the industry. Made in America, it is built using the best material and finest techniques for quality. The Life Saver Pool Fence is the result of years of testing and product improvements. Mesh material – Textilene Mesh: 12-12 Mill. The fencing is made from the strongest industrial mesh currently available in the market. It is the most transparent of all mesh pool fences and has a tensile strength of over 270 pounds per square inch. 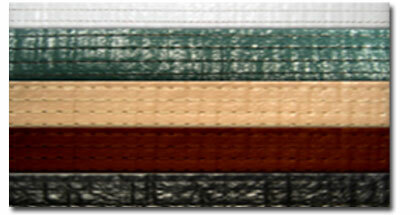 The mesh weave is made from a strong nylon basket weave and has a polyvinyl coating. It is sun-resistant and can withstand adverse weather conditions such as extreme cold. The mesh comes in a variety of flavors to accommodate different tastes. We even can mix and match mesh color and border colors to custom blend with an individuals backyard. Brown is our brand new color introduced last year and was chosen for the families who prefer a more natural looking color for their home. Life Saver only uses rounded fasteners so that there is no risk of injury to from sharp edges, like with other fence brands. Even the molding edges are rounded to perfection. The poles used for installation are triple-reinforced for a more solid installation. Third-party testing has shown that they are by far the strongest removable pool fence poles in the industry (see pole strength video here). These poles are available in several colors such as black, green, tan, brown, white and silver. Life Saver also has the high quality copper vein finish. The border used on the Life Saver pool baby fence is made of leather-engrained QuadStitch™ material. The border is secured using Aqualon thread stitches. The strong border ensures that the mesh doesn’t sag or rip off the poles. 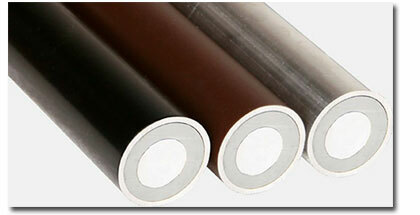 The nylon border can withstand the harshest conditions of sun and cold weather. The safety latches used by Life Saver are nickel-plated and can’t be opened without the use of both hands. It ensures that children can’t open the pool gates and reach the pool area easily. The spring set used in the latches are made from stainless steel and are resistant to rust as well as corrosion. Beginning in 2015, these latches are also now lockable. Visit our Permalocks page to learn more. All these features are put in place so that the baby fence is strong enough to offer the required protection. It is available in three and a half, four and five foot heights. 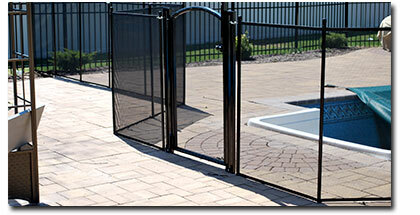 The Pool Corral Pool Fence is a quality fence with more economical pricing. 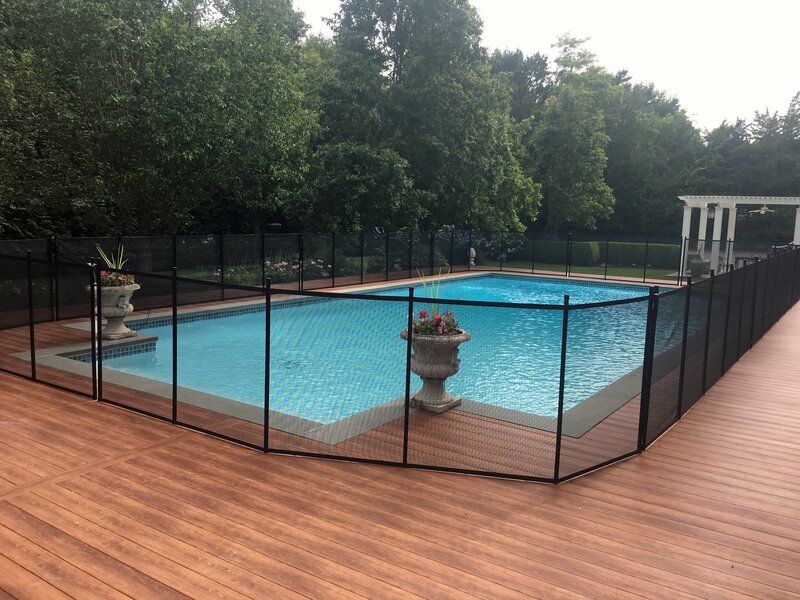 This product is in the same range of quality of the leading competitive products and allows us to provide our clients with a choice of pool fence solutions. Nylon mesh with polyvinyl coating woven with a basket weave – the most intensive mesh to mil. It is highly resistant to wrinkling and the sun’s UV rays. Using a 2-stich leather grain border, the Pool Corral swimming pool fence offers what is standard in the industry. These latches, found on most removable pool fences hook the eye of the opposing section and are secured by an outside mounted slide spring. These latches offer the option of being locked. Life Saver New York even sells quality DIY Pool Fence. For those people who are handy and prefer to get the job done themselves, PoolFenceDIY is the product for you. 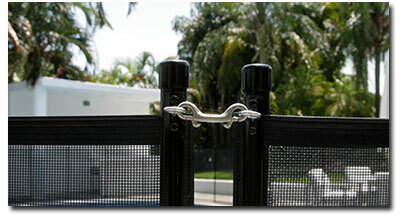 Easier to install because of its smaller diameter peg, contact us to learn more about our do-it-yourself pool fence. At Life Saver New York we are the swimming pool fence experts. Our years of experience and dedication to improvement mean our clients always receive the best. We also ensure that our swimming pool baby fences are installed to perfection. We know that accurate installation is also necessary along with the right fence material. Contact us now to know more about our fence installation process and for a free estimation of a Life Saver swimming pool fence.